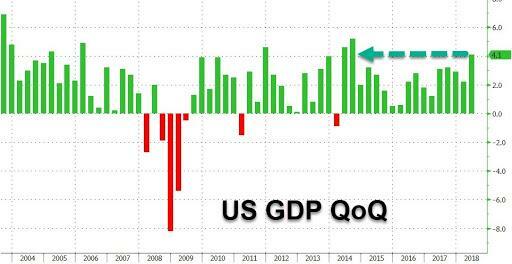 No surprises here: last night, President Trump predicted today's Q2 GDP print would show the U.S. economy is in "terrific" shape, said that "if [GDP] has a four in front of it, we’re happy" and called recent economic figures "unthinkable".. and he was right... if just barely. Moments ago the BEA reported that Q2 GDP came in at 4.1%, well below whisper numbers of a 5%+ print, and just below the consensus estimate of 4.2% (if smack in the middle of the 3%-5% forecast range), but still the highest since 2014 and nearly double the revised Q1 print of 2.2%. On a nominal dollar basis, the US economy is now above $20 trillion, doubling in size since the start of the century. 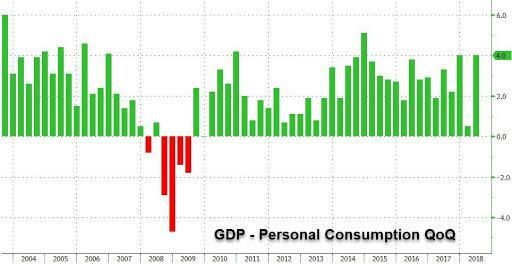 Looking at today's report, on the positive side, personal consumption rose 4.0% in 2Q after rising 0.5% prior quarter. 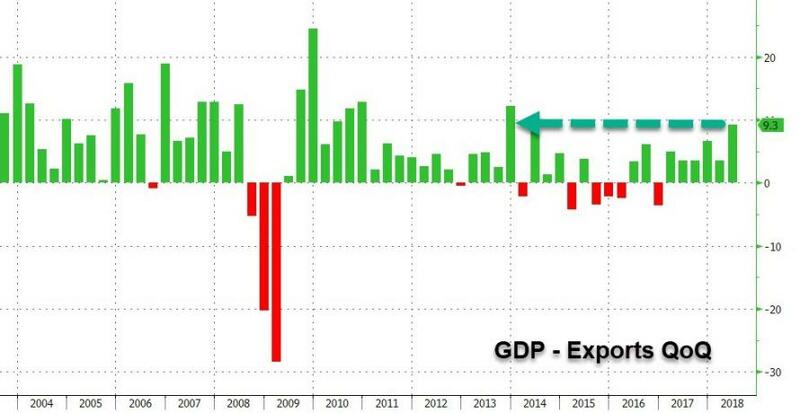 On the not so good side, the key driver behind the GDP surge was exports -mostly the scramble to ship soybeans to China ahead of the tariffs - which contributed over 1.06% to the bottom line, and the biggest annualized export growth since 2013. 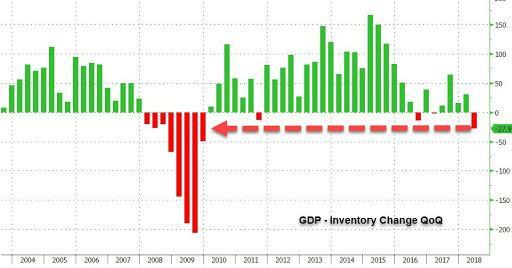 But the big surprise is that despite expectations of a major inventory stockpiling, non-farm inventories actually subtracted -1.02% from the bottom line number, suggesting that there was less stockpiling ahead of trade war than some expected, or alternatively, it means that subsequent revisions to the Q2 GDP print will be blow outs and will approach 5% as the correct inventory growth numbers are factored in. Naturally, there will be a long of high-fiving by the Trump administration today, with the president sure to boast about the GDP print for weeks to come heading into the midterms. There is just one problem with all of this: as we explained last weekend, the bulk of GDP gains came a one-time boost to US exports. And since this is a one-time adjustments, it is merely pulling demand from the future, which means ‘payback’ in 2H - and beyond - could be significant. As a reminder, in Q4 2011, US GDP was +4.6% in 4Q11, and then averaged +1.6% for the next five quarters. The one silver lining is that inventories were not a tailwind as so many had expected, so this will be wildcard either for the Q3 GDP print or, more likely, for the two revisions to the Q2 GDP number which we expect will balloon as more accurate inventory numbers come in. But the biggest problem is that if indeed there will be payback for today's number, it may come as soon as the Q3 GDP print which is due... just a few days before the midterms. So while the Trump administration will delight in today's number, the risk is that euphoria will turn to despair with just days before the midterms.